The Skinny: For lack of a better classification, the Webmaster would like to call Peking Opera Blues "The Perfect Hong Kong Film." Tsui Hark's film is a resounding cinematic wonder that mixes history, drama, comedy, romance, gender roles and old-fashioned entertainment value into one of the best examples of Hong Kong Cinema at work. Tsui Hark's classic Peking Opera Blues is an amazing piñata of a movie that combines more genres and Hong Kong-specific themes than one could possibly imagine. An unlikely concoction of historical and political intrigue, acrobatic action, screwball comedy, and unabashed romanticism, Blues holds up even fifteen years past its release. The film takes place at a firmly established crossroads in modern Chinese history. The year is 1913, and General Yuan Shi-Kai has taken power in the wake of the Qing Dynasty's fall. Yuan requires a large sum of money from European governments to stay in power, and General Cao (Kenneth Tsang) is helping Yuan secure the loan. However, his daughter Cao Yan (Brigitte Lin) is secretly working for the revolutionaries, and plots to steal the loan documents from her father. However, things aren't that easy. In the process of trying to steal the documents, she gets involved with two very different women. Bai Niu (Sally Yeh) is the daughter of Wu Ma, who runs a Chinese Opera troupe thatas was the custom at the timefeatures an all-male cast. Bai wishes to be an actress onstage, but tradition forbids it. Meanwhile, golddigging musician Hong (Cherie Chung) arrives at the opera house while chasing a wayward box of jewelry. 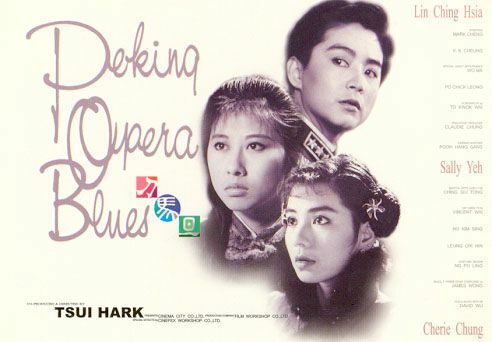 The two become involved in the intrigue when Cao Yan attempts to meet revolutionary spy Ling (Mark Cheng) at the opera house while her father is taking in a performance. However, the local law enforcement is on to them, which leads to complicated circumstances and exhiliarting happenstance. To call this film vintage Tsui Hark would be an understatement. The plot of the film deals with real history and politics, while the conflicts and growing friendship of the women take on universal significance. The setting is the Peking Opera, which Tsui glamorizes and simultaneously parodies. The gender roles are subverted, with the females appearing "masculine" while the males appear the opposite. The film features staged acrobatic swordplay (during the Peking Opera scenes), followed immediately by over-the-top, intricately staged gunplay. And there's physical and verbal comedy, which amazingly doesn't distract or even annoy. And even more amazing: the disparate genres and tones (the film shifts from wacky to wrenching in a split-second) actually work together. Peking Opera Blues proves to be as emotionally resonant as it is wildly entertaining. To properly explain how Tsui does this would be impossible. The film is a testament to his bizarre sensibilities and almost impenetrable filmmaking style, which haven't always produced the best results. Here, everything works. The comedy is endearing, and the action exhilirating and sometimes painful. The audience finds themselves pulled in many different directions simultaneously, and are treated to moments that are both emotionally tense and irretrivably whimiscal. Tsui's sudden shifts in tone might appear to be sudden, but the cinematic panache he displays is extremely winning. Equal credit should go to the actors, who turn in performances that are devoid of artifice, yet are decidedlyand entertaininglyexaggerated. Brigitte Lin anchors the film with her fine presence, but it's Sally Yeh who walks away with the picture. Her performance as Bai Nui is strong, but vulnerable. Bai Nui has the most at stake: in helping the revolutionaries she risks her life and her family. However, loyalty to her friends is what drives her, which inevitably leads her into conflict with the more self-involved Hong and Cao Yan. Eventually, what they discover is that they must trust and believe in one another to acheive their goals. The ultimate irony of Peking Opera Blues is that the victory contained within the film is really an empty one. In the tapestry of history, the characters' struggles have really no effect on China's future, nor on the destiny of the people. Following the events in the film, China reverted to internal strife and more years of "revolution." The characters only won one battle in a war which they eventually lost.